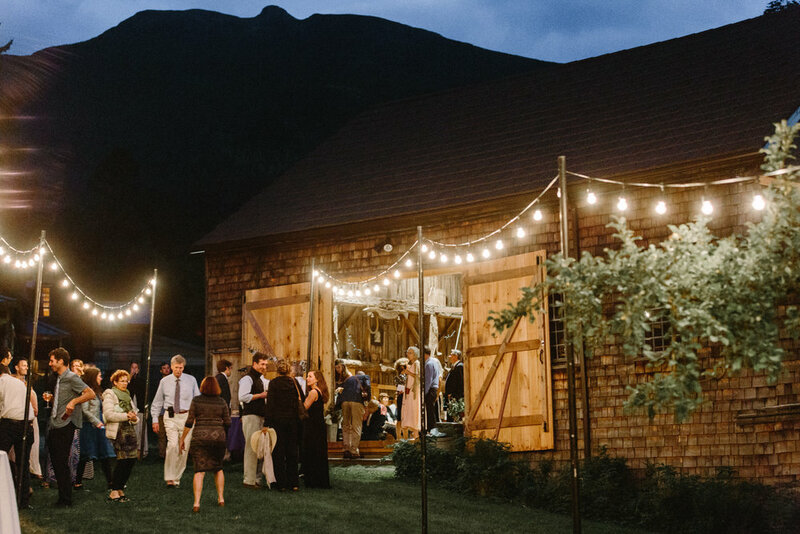 There are lots of options to work through when trying to decide the best place to hold your next event, and undoubtedly one of the best things about the Northeast of America is the beautiful outdoor setting. Below we have highlighted 5 Retreat Centers in the great state of New York that not only have beautiful, outdoor settings but that also have ample, overnight accommodation allowing you and your guests to really take advantage of your time away. Even if you do not find exactly what you are looking for, we are confident that you will find ideas and take inspiration from the venues we have shared with you. Why get a hotel or a conference center for three hours when you could book your own private resort for the weekend? Bring the family, friends, colleagues and whoever else wants to enjoy an unforgettable experience! We are set on 100 acres of privately owned lawns and woodlands located just 2.5 hours from both Boston and New York City. We have overnight accommodation for up to 500 people and a number of picturesque locations around the grounds for you and your guests to take advantage of. Our offer gives you the chance to cater for yourselves, bring in outside vendors or do both. Harmony Hill has 70 private acres, with a couple of yurts, a cabin we call the mountain chalet, hiking trails and a fieldstone labyrinth. The yurts are tucked in the woods. The cabin is at the edge of the woods. Sit on your deck and read a book. Enjoy the sounds of nature. Chipmunks scurry. Birds call to one another. Treetops chatter with gentle breezes. Maybe you’ll want to write a poem or take a nap. If you’re feeling a little ambitious, follow the lower trail as it crosses a small creek and goes through the white pine forest. Take the upper trail where you can pick blackberries in season. Follow a stone fence to see where it leads. Find the trail that ends up behind the yurts. I won’t tell you where Whimsical Meditation Corner is. I’ll let it be a surprise. Nestled in a valley near Painted Post, NY, is a conference and retreat center called Watson Homestead. The facility and its mission are the fulfillment of a dream held by a man of remarkable generosity and a great love for people. Located in rolling hills, Watson Homestead hosts education programs, corporate meetings, Road Scholar, weddings, family reunions, and groups seeking retreat. We are situated 10 minutes away from historic downtown Corning, and the Corning Museum of Glass. 30 minutes to our North, you may enjoy Watkins Glen, the Finger Lakes Wine Trail, and Seneca Lake. We welcome all people, small and large groups. Our staff will serve you with attention to detail and comfort. The Lifebridge Sanctuary is a 12,000 square foot hand crafted, green facility on 95 acres of forest and spectacular open space on the Northern crest of the Shawangunk Ridge, close to the small township of Rosendale, eighty miles north of New York City. A variety of meeting spaces are available, including the Upper Room with a wide view of the Catskills, holding up to 60 people and numerous smaller spaces. Up to 36 people can stay in the comfortable bedrooms, many with mountain or forest views. Dining can be inside or out, formal or informal and events can be fully catered or the group can prepare meals together in the state of the art kitchen. The Manor home was discovered in the early 2000's. The secluded beauty of the property inspired the construction of the banquet hall which officially opened in 2003. Since then, the River Stone Manor has been one of the finest venues in the capital district for weddings, corporate events and social gatherings. The newly-renovated Banquet Facility has been placed on a knoll offering unspoiled views of the river and surrounding landscape. The Banquet Facility can comfortably seat up to 325 guests depending on your needs and features a full wall of windows and French doors which open up to a beautiful patio. This newly built facility offers perfect acoustics for your musical hosts and provides incredible photo opportunities for your photographers. There are so many amazing and unique retreat centers all across the North East of the United States that sometimes it can be overwhelming to know where to begin. Do you look for somewhere with amazing facilities? Somewhere that has a large number of onsite accommodation? Or are you simply looking for somewhere nearby so that you and your guests do not have to travel very far? Whatever you are looking for, we think that we have identified 5 unique conference centers around the Albany area that all offer something different that you are and your guests can take advantage of. We hope that no matter what sort of retreat center you are looking for, you find some inspiration here. Set in the beautiful foothills of the Berkshires, Camp Schodack is a retreat center like no other. Close to Boston and New York and only a 20 minute drive from downtown Albany. With overnight accommodation and dining facilities for up to 500 guests you really could invite everyone you know for a weekend away. No matter what the occasion, the team at Schodack has got you covered. Every group that books can take advantage of all that the Camp has to offer including go-karting, a 40ft climbing tower, heated swimming pools, tennis courts and much more. The team there have been creating amazing summers for children and young people since 1953 when the Camp opened and they have been holding reunions, retreats, weddings, sports groups and more over the past 20 years. Grace Manor Christian Retreat Center exists to serve as a peaceful and welcoming place where communities of people can gather to cultivate spiritual and personal growth. Grace Manor Christian Retreat Center is nestled in the Great Northern Catskills of Upstate New York. Founded in 1990 , the center has provided individuals, families, and churches an environment where everyone can enjoy the beautiful surroundings of our countryside resort. With nearly 100 acres of land to explore, delicious buffet style meals, four conference meeting room, guest rooms to accommodate up to 150-200 people, sports grounds, and more, it is no wonder that many of our guests hold annual events at Grace Manor. Yoga, meditation, Running, Hiking, Music makers, Reunions, Company getaways and off-sites, Workshops, Bachelorette send offs, or simply R&R. We are a small Farm Retreats Venue in Upstate NY. We love to host intimate groups that resonate with the mission of the farm. It is a great backdrop to host workshops, celebrations, or just escapes to nature with family and friends. Come share the magic and grow with us. Farm fresh vegetables punctuate long sessions in the Yoga room and time spent in your rambling back yard or by the Fire circle. Growing Heart has many special spots to explore across acres of mixed natural habitats. A bird lover’s paradise we host every bird species indigenous to the Hudson Valley. Our swimming hole is just steps from the house. A rustic outdoor chapel with a stone portal overlooks a meadow with the Appalachian trail in the distance. A 300-year-old oak tree presides over a sacred circle in the woods. And a swing hangs from a maple tree in the back yard to name a few points of interest on the farm. Our yoga studio can accommodate a class of 20. We are a few miles from the Appalachian trail, local ski areas, and other local attractions. Located in the heart of downtown Albany, the Albany Capital Center is within walking distance of restaurants, hotels, shops, art galleries, night clubs, museums and more! Operated by SMG, the Albany Capital Center is a beautiful glass structure that can accommodate 10 to 5,000 people. Housing 22,500 square feet of ballroom/exhibit space, 6 meeting rooms with 9,200 square feet of space, and 13,500 square feet of pre-function space. The Albany Capital Center provides all of the top-notch amenities needed for your successful meeting or event. The Albany Capital Center is directly connected to the Empire State Plaza Convention Center, The Egg Performing Arts Center, and the Times Union Center arena via an enclosed walkway. Together, these spaces create the Capital Complex, the largest meeting space in Upstate New York at more than 159,000 square feet. Collective Retreats is a new, meaningful way to travel. Each retreat is located in an iconic destination and features luxury outdoor camping accommodations, exceptional culinary experiences, and genuine hospitality. We created Collective Retreats because we love travel and believe in its power to help us connect to places, to people, and ourselves.A picturesque drive just two hours from New York City, Collective Hudson Valley is the ideal upstate getaway. This bucolic retreat is set on Liberty Farms, a working organic farm with easy access to Hudson’s stylish boutiques and quaint shops. Surrounded by the state’s best farms and food producers, there is easy access to hikes, historical sites, and much more. If you are thinking of planning an outdoor wedding, then picking a beautiful venue to celebrate your weekend can be a daunting task. 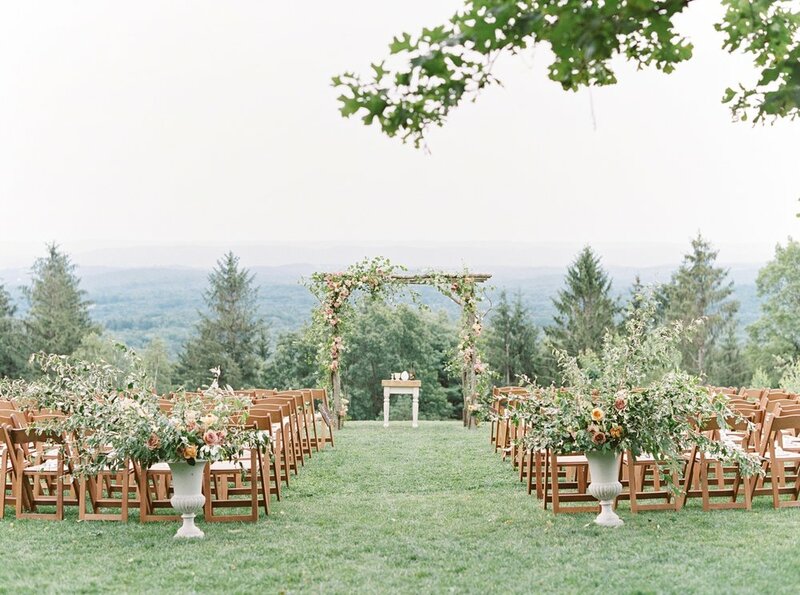 To help you out we have picked 5 beautiful outdoor wedding venues across New York. All of these venues are completely unique from one another and each has its own distinctive feel and history that makes them so special. Whatever you are planning for your big day, we think that you’ll find a location here that will suit your needs or at the very least, inspire you. Why get a hotel or a conference center for three hours when you could book your own private resort for the weekend? Bring the family, friends, colleagues and whoever else wants to enjoy an unforgettable experience! We are set on 100 acres of privately owned lawns and woodlands, under the same continuous family ownership for 4 generations. 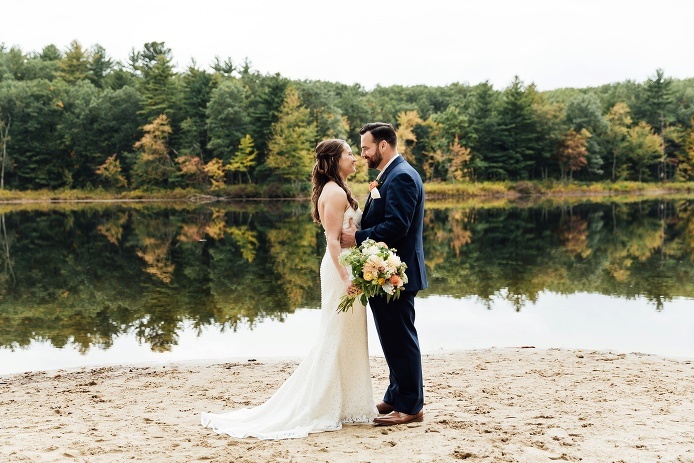 Located just 2.5 hours from both Boston and New York City and accommodation for up to 500 people with a number of picturesque locations around the grounds that people have chosen as the ideal place to tie the knot. We combine our intimate venue, fresh innovative cuisine, and exceptional hospitality into a memorable guest experience. Avanti is part of an elite, invitation-only, group of caterers known as the Leading Caterers of America and as such, we work tirelessly to push a standard of excellence in hospitality that we can feel proud of and our clients can enjoy. The story of the Historic Barns of Nipmoose harks back to the 18th century when the Nipmoose Farm was first established, in a region known at the time as the Wanepimoseck Valley. The Nipmoose Farm’s land (123 acres) includes sloping fields, woodland, conserved wetlands, an apple orchard, poplar grove and flower garden. A pond is positioned near the barns, and the Nipmoose Creek flows along the west boundary line. Welcome to the most unique event barn in the Rochester area. We are located just 30 minutes south of Rochester in the Town of Livonia. Renovations of our historic dairy barn were completed in June of 2014 keeping as much of the original character and charm of the old barn as possible, while adding many modern amenities to make every event comfortable for you and all your guests. This chic industrial event venue is located in the trendy downtown neighborhood of Tribeca, New York City. Located on a cobblestone street in a 1920's printing press building, Tribeca Rooftop is perfect for creating a highly personalized atmosphere for your extraordinary wedding. The expansive glass atrium and large windowed walls offer an iconic backdrop for your ceremony. Finding the right location for your event can be a challenging task, especially when there are so many options to choose from. Having been providing amazing experiences for over 60 years, we know that choosing the right Retreat Center is important, so here we have taken a look at 5 totally different Retreat centers in and around New York State to give you and your guests inspiration for next getaway. With overnight accommodation for up to 500 guests at any one time, Camp Schodack is a truly unique location in the foothills of the Berkshires. Spread over a 100-acres, this privately owned venue operates as a Summer Camp from mid-June to mid-August. One of the benefits to a venue such as this is that any rental group has the bonus of taking advantage of all of the activities that are part of the property during their stay. These include go-karts, archery, a climbing tower, 7 tennis courts, 2 heated outdoor swimming pools as well as a range of indoor and outdoor areas and meeting spaces to take full advantage of the beauty of the capital region. There are spaces that touch the heart and soul in ways that you will not find anywhere else. Peace Village is a learning and retreat center that offers weekend retreats on a variety of topics where you can learn to meditate and study spiritual knowledge. The silence and tranquility of the Village provides the atmosphere for self-exploration and spiritual practice. Practicing yogis volunteer and teach at Peace Village. Their hospitality and warmth while hosting you during your retreat will be one of the memorable aspects of your stay. Peace Village opened in 1999 and is a retreat center of the Brahman Kumaris . In 1994 Kadampa Buddhist teacher Geshe Kelsang Gyatso established Chakrasambara Center in New York City and requested one of his senior students, Kadam Morten, to become the principal teacher. The Center started off in a small graffiti covered dance studio near the Bowery, and by 2001 classes were being held in a rented commercial space in Chelsea. With an unprecedented volume of people seeking these teachings and meditations each week, we faced an immediate need to expand. In late 2011 we located and were able to purchase a street front space only two blocks away from our longtime location. After an extensive build-out and the installation of numerous newly cast Buddha statues, in October 2012 we opened the doors to the future of Kadampa Buddhism in New York City. Bailey Farms was settled by John Young in the early 1800s, and the original farmhouse still survives. The property was acquired in that century by “Old Ira” Bailey, from whom the Farm gets its name. In the early 1900s, the property was purchased by a Broadway actress. Next, legend has it that a wealthy New York gentleman took ownership of the Farm and in 1937 built a replica of a Georgian estate house for his wife, who had admired a picture of a similar structure in a British magazine. Twenty years ago, Bailey Farms became the retreat and conference center it is today, dedicated to serving the larger community. We regularly welcome schools and colleges; professional and business associations; churches, synagogues, and other religious / spiritually oriented groups; community, civic, and cultural groups. Set in a secluded valley beside an enchanting stream in the heart of the Catskill mountains, Menla is a hidden oasis, featuring spiritual and wellness retreats as well as exclusive getaways and the world-class Dewa Spa. A truly unique venue, Menla is the Dalai Lama’s cultural center in North America—a modern retreat and destination spa inspired by the ancient Buddhist kingdom of Tibet. Immerse yourself in the magic of our pristine mountain forests, explore hiking trails, encounter wildlife, and discover a rich tapestry of wellness experiences and activities, including workshops with renowned teachers, yoga and meditation, Tibetan healing therapies, massage and other bodywork, and so much more. If you are looking for a conference center to hold your next event, then take a look through our 5 incredible options for locations to hire in New York and the North East of the US. We have varied our range to include Conference and Retreat Centers in a number of locations with offerings near lakes, in the woods, cities, farms and more. Whatever the aim of your event, we think that you’ll find a location here that will suit your needs or at the very least, inspire you. Why get a hotel or a conference center for three hours when you could book your own private resort for the whole weekend? Bring the family, friends, colleagues and whoever else wants to enjoy an unforgettable experience! Schodack is the ultimate corporate get away accommodating up to 500 guests. Whether you want to spend your time relaxing with colleagues by the pool, using our extensive indoor spaces for planning and discussions or perhaps you are looking to challenge your group to get the most from themselves through our adventure course, go-kart track or any of the amazing activities we have available. We look forward to welcoming you on your next vacation to Hope Lake Lodge Resort and Conference Center in Upstate New York, a first class destination situated on more than 1,600 acres of forests and hills in the beautiful Finger Lakes Region of New York state. Getting to Hope Lake Lodge is easier than you think. Convenient to Interstate-81, Hope Lake Lodge is located halfway between Binghamton and Syracuse near Ithaca, New York. Our central location is just a short drive from many metro areas like NYC, Philadelphia, New Jersey, Toronto, Rochester and Buffalo. We have 40 acres of open lawns and sports fields. On our property we have access to a huge number of sports and activities for all ages and abilities. These include an all weather, street hockey rink, archery range, softball/baseball field, 2 soccer pitches (one floodlit), 2 outdoor basketball courts (one floodlit), a huge indoor field house with basketball court that is suitable for many activities. Also on site is our 2 heated swimming pools, a large go-kart track, sand volleyball court and 7 newly laid tennis courts. Furthermore we have a 40 ft climbing tower with 5 sides of varying difficulty and a high ropes adventure course with multiple elements. In addition to all this we are surrounded by a further 60 acres of privately owned woodlands perfect for hiking, exploring and cross country runs. Here at Camp Schodack we are incredibly fortunate to have such a beautiful and easily accessible property in the State of New York. We are located close to the Massachusetts, Connecticut and New Hampshire borders. Set in the foothills of the Berkshires near Albany in the capital region, we are only 2.5 hours from Boston and New York City and as such we are in a prime location in the North East of the United States with great transport links. Choosing to plan your next event with us doesn’t mean you have to break the bank. We have a dedicated team who will be on hand with you from day one to help you as much or as little as you want. Want to bring in your own catering? No problem! Thinking of planning your own entertainment? Fine with us! You can create your own DIY package to suit your needs or ask our team to help you do it all and let us take the reins. We have been creating amazing summer experiences long enough to have learned how to do it well. Each of our main cabins are equipped with cooling fans for the warmer weather and each has their own bathroom and shower facilities inside for the convenience of you and your guests. They are also fitted with porches outside with ample seating. Alongside our main cabins we also have a number of smaller, private accommodations that can sleep couples or individuals should you need use of them. Beyond our accommodation we also have a large, open plan dinning room that can comfortably seat 500 people with access to a large patio should anyone wish to eat outside. We are also fortunate to have many open, outdoor spaces such as our 500 person amphitheater in addition to several covered indoor spaces that can house groups of various sizes to suit your requests, such as our Rec Hall, our Playhouse and more. Being located so close to both Boston and Manhattan means that we are in an excellent location for groups in either of those cities. It also means that in the rare case that you may think about venturing beyond our borders for a visit to a nearby State Park, a museum or maybe a concert in Albany, we’ve got you covered. But we promise that there is so much happening on the property that you won’t want to leave. We have a number of large indoor and outdoor meeting areas and spaces for activities including our 500 seater playhouse, our Recreation Hall, large outdoor amphitheater and quaint Gazebo for smaller group gatherings. Our site can house up to 500 people in our beautifully renovated cabins. Each comes with high ceilings and fan units which keeps them cool during the hot summer days and warm in the cooler evenings. Each of our cabins comes with its own large porch area complete with outdoor seating for you and your guests to take advantage of. We are truly hidden away from the outside world and yet still easily accessible for you and your guests. Pull into the parking lot, leave your keys in your cabin and you can spend the rest of your time with us blissfully unaware of the anything else going on. Our guests really get the chance to reconnect with nature and each other. Spend time exploring the 60 acres of woodlands trails around us or ditch the shoes and wander barefoot across our 40 acres of green lawns whilst you enjoy the surroundings. As we operate as a summer camp from Mid-June to Mid-August our facility is equipped with all of the activities you would associate with a traditional summer camp in the 21st Century. These include popular sports like soccer, lacrosse, basketball and hockey in addition to individual activities like golf and tennis. We have more adventurous activities such as our 40 ft. climbing tower, zip-line, high ropes adventure course and purpose built go-kart track not to mention 2 heated outdoor swimming pools. Choosing to plan your next event with us won’t break the bank. Our dedicated team will be on had with you to help you as much or as little as you want. Want to bring in your own catering? No problem. Thinking of planning your own entertainment? Fine with us. You can create your own DIY package to suit your needs or ask our team to help you do it all and let us take the reins. 5 fun ideas to include at your wedding to add a little excitement! One of the great things about hiring a Summer Camp venue for your next event, no matter what the occasion, is that you and all of your guests get to make use of the fantastic facilities, the huge amount of onsite accommodation and of course, all the activities! What could be better on a hot day than breaking out a slip ‘n’ slide? How about an 80ft inflatable water slide purpose built on a hillside for you to slide down and cool off! Simply put, it’s the best way to get down a hill! 40 feet high with 5 different climbing faces, each with varying difficulty levels for you to test your might and all the while you are securely harnessed in and safe to climb at your own leisure with our auto-belay system - so no need to wait around, you can climb as much as you need without further assistance. Whether its your first or 50th time, the adrenaline that courses through you doesn’t change as you climb to the top of the platform and prepare to take that leap of faith off the top, is amazing. The view is worth the nerves but the feeling you get when you are flying through the air is almost second to none! For beginners and adrenaline junkies alike, we defy anyone not to get behind the wheel of one of our karts and not pretend that they are competing in the Indy 500! Pop on a helmet, position your goggles and put the pedal to the metal. Mario Andretti eat your heart out! There are few things better in life than overcoming challenges and our high ropes course is full of them - Jacobs Ladder, the Rope Swing or if you can muster the courage - the Trapeze! Getting to the top, jumping out fully stretched and catching the bar really is the most amazing sensation! Why confine yourself to a room in a hotel or conference center when you can make use of 100 acres of open lawns and woodlands in the countryside surrounded by all the beauty of nature. Create the wedding you want without limitation. Want to bring your own caterers? decorations? your best friend Sally’s dog? Go ahead! You can make the schedule that works best for you without anyone telling you otherwise. Summer Camps are set in beautiful locations and available during peak seasons. Whether it is spring, summer or fall, the great American outdoors is a truly spectacular backdrop for any event. Get married on a hilltop or in the woods, with beautiful green lawns stretching out as far as you can see or under a canopy in the trees - You can do it wherever you like. It’s a Summer Camp and that means all the benefits of having plenty of activities right outside your front door. Basketball, baseball, go-karts, swimming pools, climbing towers, woodland hikes, mountain bikes and more. You name it, they have it and they are all available to entertain you and your guests. By renting the facilities, you have the run of the place and can be as lavish or as cost effective as you like. Let them do all the catering or host your own BBQs. You can bring in food trucks or enjoy Camp favorites like grilled cheese! Having people look in at what is going on can feel impersonal when you are trying to celebrate with friends and family. By having the entire place to yourselves you can hold your dream wedding away from peering eyes and really make it special. Who is going to make the ceremony and then who will only be invited to the reception??? You don’t have to worry about that at Camp. With bunks, cabins and accommodation normally used to holding hundreds of people, you can invite everyone you want with no fear of running out of room. EXPERIENCE THE MAGIC OF CAMP, AGAIN. If you ever went to summer camp then you know how special it is and you’ll get to dive back into that world for the weekend to celebrate your special day. Plus any guests that never went to Camp can finally see what all the fuss is about. There is no expectation that you will be just there for the day. Many Summer Camps will let you have the facilities overnight or even for the whole weekend. This means that you are in no rush. You can really savor every moment with your guests. Imagine getting to the end of your wedding celebrations and watching fireworks paint the sky and after that, instead of having to put everyone in taxis home, you can all wrap up warm and sit round a fire, roasting marshmallows and talking about how great the weekend was. When you are finally done for the night you’ll only have a short walk back too your cabin! Beautiful outdoor camp wedding in the woods of Ontario in Parry Sound! Photos found at Rosewood Wedding Photos blog. Simple and elegant! These beautiful photos were found at Lauren Fair's photography blog. These amazing photos were done by photographer Ashley Largesse! 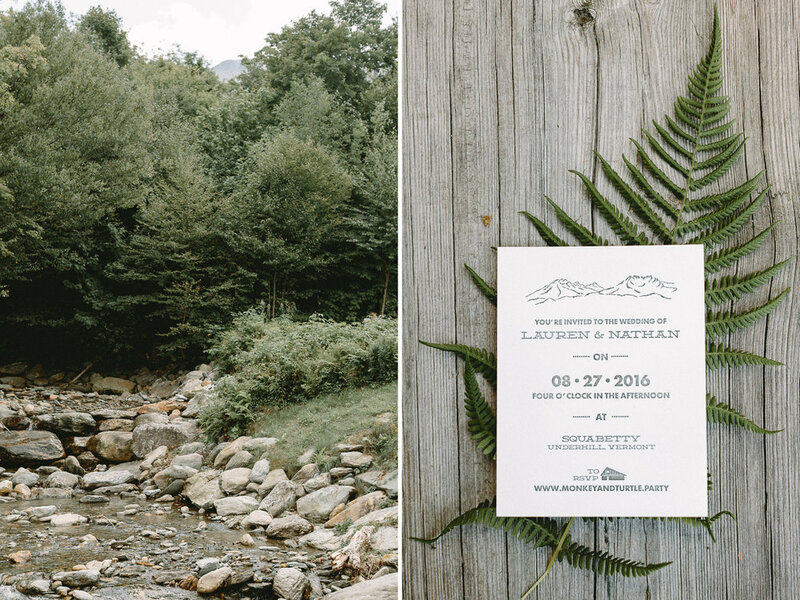 Very trendy and charming Vermont wedding!